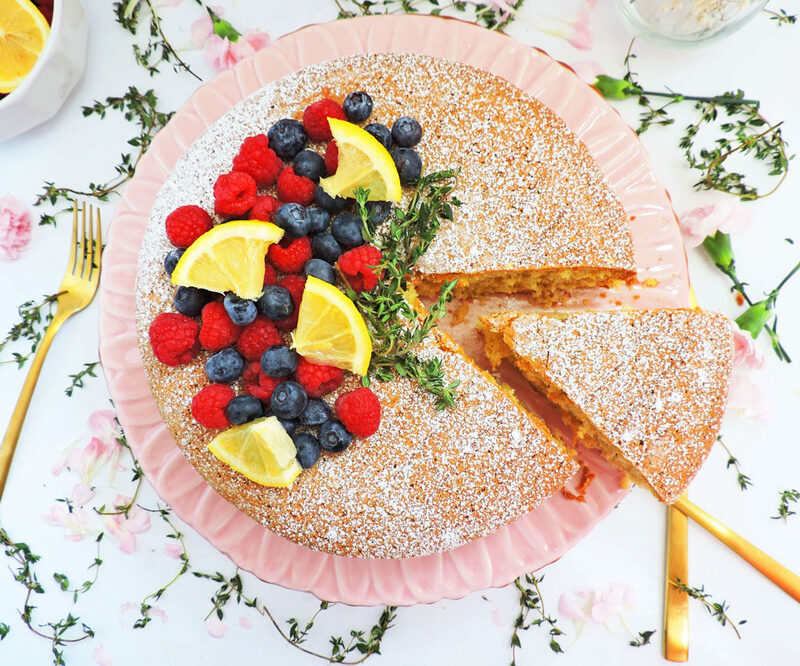 This Rustic Lemon & Thyme Olive Oil Cake is the perfect Spring dessert! 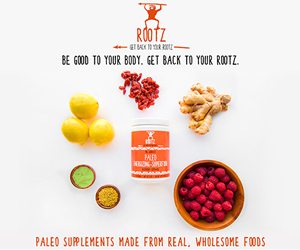 It’s filled with so many bright and delicious flavors! During Springtime, I love to decorate everything in beautiful, bright colors, including my food! Yep, that’s right! I love to add beautiful flowers and brightly colored fruit to my cocktails and salads to make them oh-so-pretty! 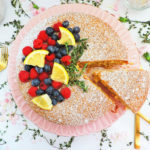 That’s what I did when I served these yummy Peachy Blackberry & Thyme Cocktails and this heavenly Rustic Lemon & Thyme Olive Oil Cake! 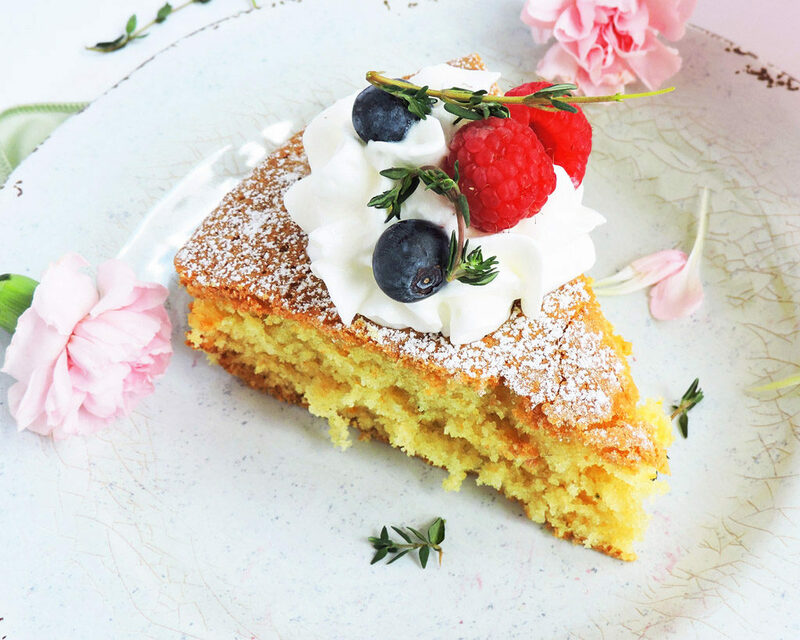 If you’ve never had olive oil cake, you’re completely missing out! I’d been wanting to make an olive oil cake for awhile but was a little intimidated by that distinct flavor. 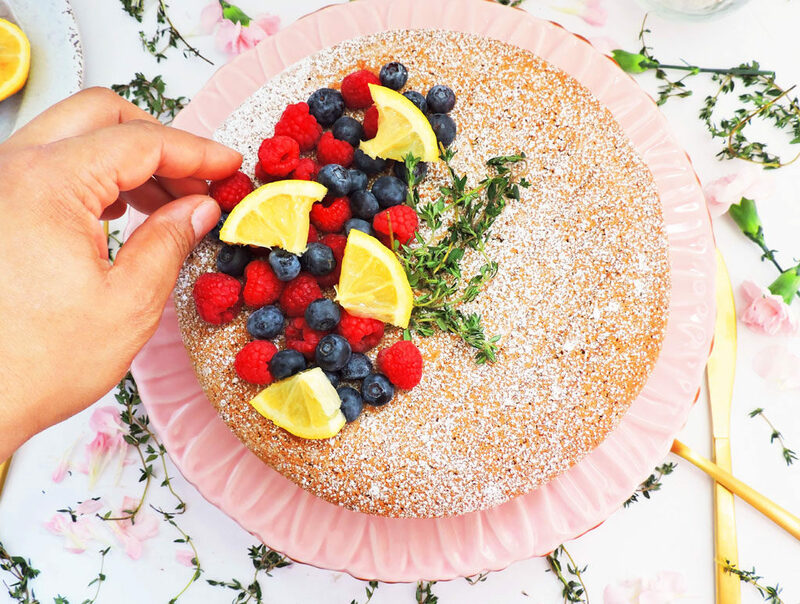 Whenever I think of olive oil, I imagine savory recipes…not cake! 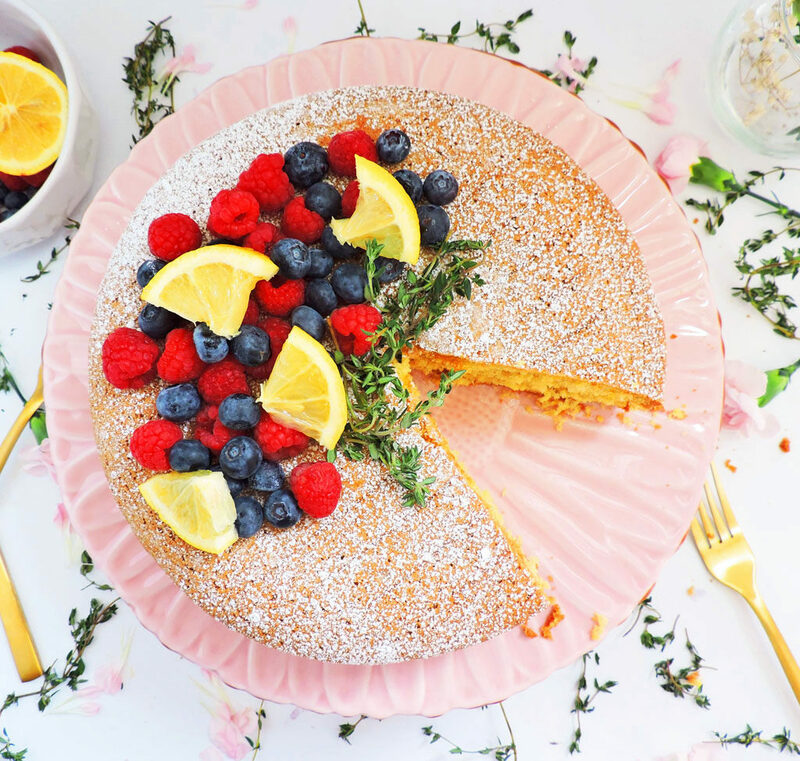 Let me just say…I was pleasantly surprised when I experimented with this Rustic Lemon & Thyme Olive Oil Cake recipe! The olive oil provided wonderful flavor and moistness! I decided to add fresh lemon and thyme to compliment the flavor of the olive oil! It was the perfect combination! The thyme brought out the flavor of the olive oil and the lemon added an element of freshness that was unbelievable! For this one-layer Rustic Lemon & Thyme Olive Oil Cake, I used a little less sugar than the average olive oil cake recipe. In most of my dessert recipes, I like to reduce the sugar amount or use a natural sweetener such as honey or agave to help make my recipes just a tad bit healthier! 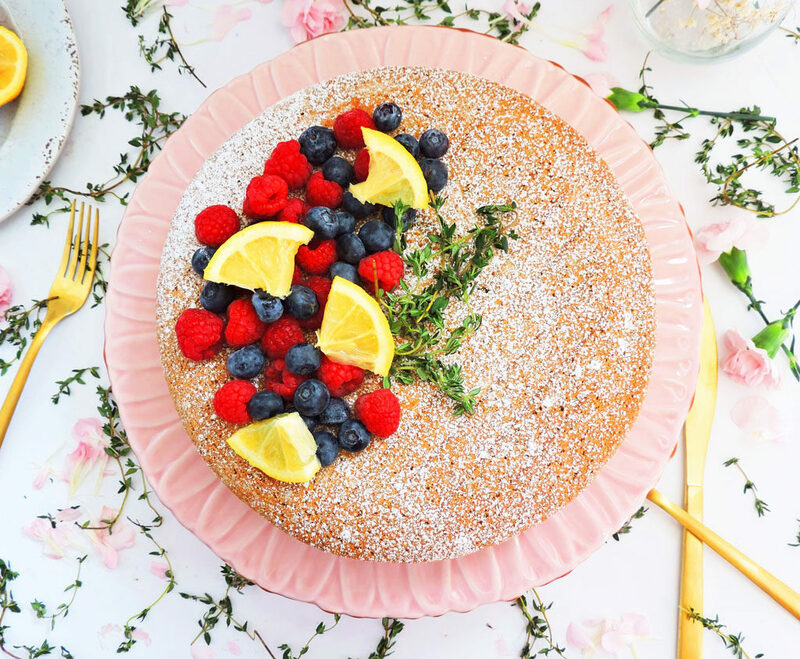 For the finishing touch, I sprinkled a little powdered sugar on top and decorated it with some beautiful fresh fruit and thyme! 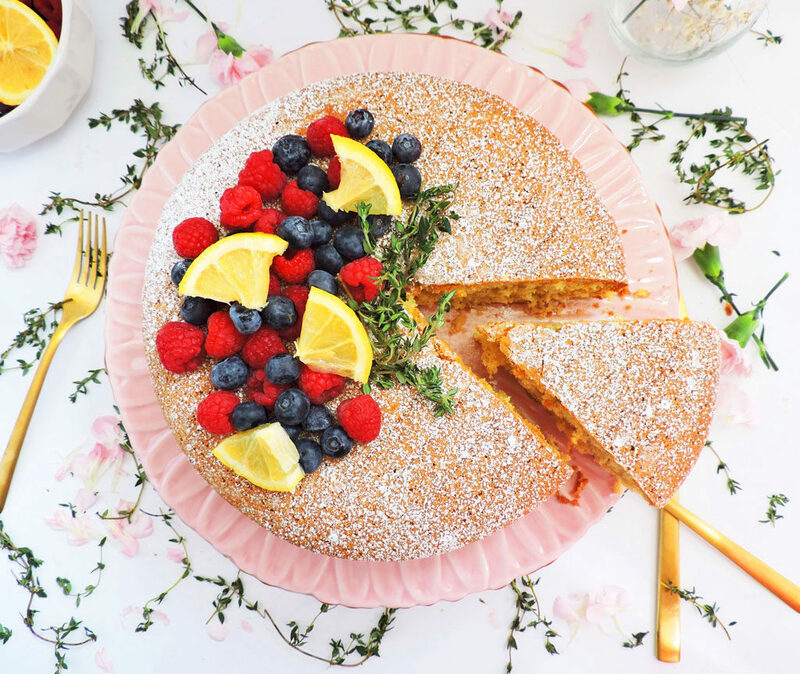 This delicious Rustic Lemon & Thyme Olive Oil Cake would be the perfect centerpiece or dessert for your next Spring event! I’m definitely thinking about serving this at my Mother’s Day Brunch! Preheat the oven to 350 degrees. Grease a 9-by-2-inch round cake pan with a little olive oil and flour the pan. In a medium bowl, whisk together the flour, baking soda, and baking powder. Set aside. In a larger bowl, add eggs, sugar, olive oil, lemon zest, vanilla extract, and thyme and beat with an electric mixer on medium-high speed for about 3 minutes. Beat until the mixture is pale yellow and thickened. Turn the mixer to low, and slowly add the milk, followed by the lemon juice. Mix until the ingredients are incorporated. Add the flour mixture 1/2 at a time, mixing on low after each addition, until just combined. Be careful not to over-mix. Pour the batter into the prepared pan. Bake for about 35 minutes or until golden brown and a toothpick inserted into the center comes out clean. Cool the cake for 10-15 minutes and place on a cake plate or cake stand with the rounded side up. Using a fine-mesh sieve, dust the top with powdered sugar, and decorate with fresh fruit and herbs.